Original Green Superfood is a powerful blend of nutritious greens, phytonutrient-packed fruits, veggies and cereal grasses, digestive enzymes and probiotics which increase helps to energy, support detoxification and helps to boost your immune system. 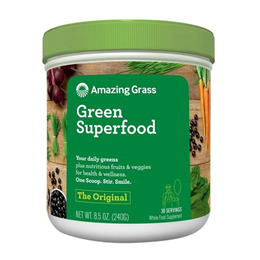 Green Food Blend (71%) (Organic Wheat Grass, Organic Barley Grass, Organic Alfalfa, Organic Spinach, Organic Spirulina, Organic Chlorella (cracked cell-wall) and Organic Broccoli). Fruit & Vegetarian Blend (14%) (Organic Rose Hips, Organic Pineapple, Organic Carrot, Acerola Cherry Extract, Green Tea Extract, Organic Acai, Organic Beet, Raspberry, Organic Maca). Fibre Blend (Fructooligosaccharides, Organic Flax Seed, Apple Pectin), Peppermint Leaf, Anti-Caking Agent (Silicon Dioxide), Enzyme Blend (Lactobacillus Acidophilus, Protease, Amylase, Lipase, Lactase, Cellulase. Below are reviews of Amazing Grass Green Superfood Original - 240g by bodykind customers. If you have tried this product we'd love to hear what you think so please leave a review.